Newt has delegated new hire training to Brandon before, and with that precedence, Brandon’s going to get saddled with it again and again. If you’re out of work and looking for a job, temp services are a great way to save time and energy in getting a job. Unfortunately, it’s probably the kind of job that even an illegal immigrant would shy away from. 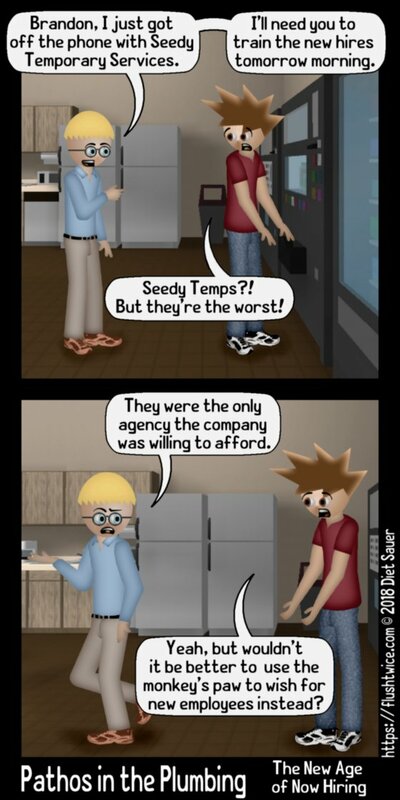 One of the reasons companies resort to temps is because many employers and potential employees despise the traditional method of having the candidates submit applications and resumes, screening the applications and resumes, interviewing the applicant, scheduling orientation/training time, and then dealing with the buyer’s remorse for hiring them in the first place. Temps just streamline the hire to fire process. Of course from the employers perspective, it can make you a bit cynical about new hires, and from the employee’s perspective, it can make you rather jaded about the employers, and even though people were probably better off with the old system, when the parties involved see what it would entail, no one is willing to use it.